↑ Cf. «Bill McKibben», Oracle Oracle Thinkquest. library.thinkquest.org. ↑ En 2010 el periódico Boston Globe lo calificó como el «principal medioambientalista de la nación» (cf. Anis Shivani, «Facing cold, hard truths about global warming») y la revista Time lo describió como "the world's best green journalist" -el mejor periodista de la naturaleza (cf. Bryan Walsh, «The Skimmer», Time.com.). ↑ Cf. middlebury.edu, «Author and environmentalist Bill McKibben appointed Schumann Distinguished Scholar at Middlebury College». ↑ Middlebury Author and environmentalist Bill McKibben appointed Schumann Distinguished Scholar at Middlebury College. Consultado el 16 de mayo de 2013. ↑ Hodges, Sam (3 feb 2012) The United Methodist Reporter Q&A:Bill McKibben, UM writer/activist, keeps focus on climate change. Consultado el 16 de mayo de 2013. Wikimedia Commons alberga una categoría multimedia sobre Bill McKibben. 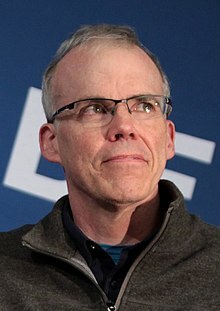 Wikiquote alberga frases célebres de o sobre Bill McKibben. Esta página se editó por última vez el 5 nov 2017 a las 16:05.